All Web addresses mentioned were functional as of 9-16-16. From the Cumberland Gap to the Atlantic Ocean, this is Virginia Water Radio for the week of September 19, 2016.
and for the Clinch River, “Clinch Mountain Quickstep” by Timothy Seaman [MUSIC - ~ 4 sec]. Question 1: Name the river whose main stem is NOT actually in Virginia. [SHORT SILENCE THEN MUSIC – ~ 5 sec - “All Quiet Along the Potomac”] That’s the Potomac River, which is part of Maryland. Question 2: Which of the rivers mentioned has its entire drainage area, or watershed, within Virginia? [SHORT SILENCE THEN MUSIC – ~ 4 sec - “Rappahannock Running Free”] The answer is the Rappahannock River. Some might have said the James, but a small part of its headwaters is in West Virginia. Question 3: Which Virginia river has the largest watershed? [SHORT SILENCE THEN MUSIC – ~ 4 sec - “James River Blues”] This time the answer IS the James River, whose watershed covers over 10,000 square miles in Virginia. Question 4: What’s the longest river in Virginia, counting only each river’s main stem, not all of the tributaries? [SHORT SILENCE THEN MUSIC – ~ 4 sec - “James River Blues”] Once again, it’s the James, whose main stem travels about 340 miles. Question 5: What Virginia rivers flow generally north? [SHORT SILENCE THEN MUSIC – ~ 12 sec - “Banks of New River” and “Shenandoah”] Virginia’s major northerly-flowing rivers are the New River and the Shenandoah River. And last, question 6: What river flows southwesterly into Tennessee? [SHORT SILENCE THEN MUSIC – ~ 6 sec – “Clinch Mountain Quickstep”] That’s the Clinch River, one of several rivers in southwestern Virginia flowing toward the Volunteer State in the Tennessee River watershed. If you’re thinking that this short quiz left out some major Virginia rivers, you’re right! Other main rivers in the Commonwealth are the Holston, Roanoke, and York. And parts of Virginia drain into rivers or other water bodies in other states, including the Big Sandy River that forms the border between Kentucky and W.Va.; the Yadkin and Chowan rivers in North Carolina; and Albemarle Sound on North Carolina’s coast. Thanks to all the musicians mentioned for permission to use their music. And we close with another musical excerpt, one that’s fitting for the activity you just did: “Exploring the Rivers” by Timothy Seaman. 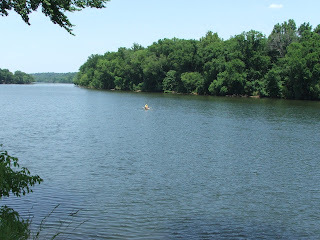 “All Quiet Along the Potomac Tonight” was recorded for Virginia Water Radio by Stewart Scales and Chloe Benner; this music was featured in Virginia Water Radio Episode 318, 5-30-16. “Clinch Mountain Quickstep,” by Timothy Seaman, is from the 2002 album, “Sycamore Rapids,” copyright by Timothy Seaman and Pine Wind Music, used with permission; this music was featured in Virginia Water Radio Episode 184, 10-21-13. “Shenandoah,” performed by Timothy Seaman and Paulette Murphy, was from the start of “Hazel River,” on the 1997 album “Here on this Ridge,” copyright Timothy Seaman and Pine Wind Music, used with permission; this music was featured in Virginia Water Radio Episode 130 (10/1/12). “Exploring the Rivers,” by Timothy Seaman, is from the 2006 album “Jamestown: On the Edge of a Vast Continent,” copyright by Timothy Seaman and Pine Wind Music, used with permission; this music was eatured in Virginia Water Radio Episode 140, 12-10-12. More information about Timothy Seaman is available online at http://www.timothyseaman.com/. “James River Blues,” by Old Crow Medicine Show, is from the 2006 album “Big Iron World,” copyright Nettwork Records, used with permission; this music was featured in Virginia Water Radio Episode 166 (6/17/13). More information about Old Crow Medicine Show is available online at http://www.crowmedicine.com/. “On the Banks of New River,” by Whitetop Mountain Band, is from the 2008 album, “Bull Plus 10%,” copyright Whitetop Mountain Band and Arhoolie Records, used with permission; this music was featured in Virginia Water Radio Episode 109 (5/7/12). More information about Whitetop Mountain Band is available online at http://whitetopmountainband.tripod.com/index.html. “Rappahannock Running Free,” by Bob Gramann, is from the 2008 album, “Mostly Live,” copyright by Bob Gramann, used with permission; This music was featured in Virginia Water Radio Episode 71 (7/11/11). More information about Bob Gramann is available online at http://www.bobgramann.com/. James River at Robius boat landing in Chesterfield County, Va., June 21, 2007. New River near Eggleston, Va. (Giles County), August 13, 2016. White’s Ferry on the Potomac River, viewed from Loudoun County, Va., March 23, 2008. Rappahannock River near Remington, Va., (Fauquier County), December 27, 2009. North Fork Shenandoah River at U.S. Highway 55 on the county line between Shenandoah and Warren counties, Va., October 13, 2012. Radford University, Virginia’s Rivers, online at http://www.radford.edu/jtso/GeologyofVirginia/VirginiasRivers/Drainage-1.html. Frits van der Leeden, The Environmental Almanac of Virginia, Tennyson Press, Lexington, Va., 1998. Frits van der Leeden, Virginia Water Atlas, Tennyson Press, Lexington, Va., 1993. Kathryn P. Sevebeck, Jacob H. Kahn, and Nancy L. Chapman, Virginia’s Waters, Virginia Water Resources Research Center, Blacksburg, Va., 1986. Virginia Department of Conservation and Recreation, “Virginia’s Major Watersheds,” online at http://www.dcr.virginia.gov/soil-and-water/wsheds. Virginia Museum of Natural History, “Virginia’s Water Resources,” special issue of Virginia Explorer, Winter 2000, Martinsville, Va.
West Virginia Department of Environmental Protection, “West Virginia Watersheds,” online at http://www.dep.wv.gov/WWE/getinvolved/sos/Pages/Watersheds.aspx. For previous episodes on water-related geographic features in Virginia, please see the “Rivers, Streams, and Other Surface Water” category” category at the Index link. Following are links to some geography-related episodes. Walk across Virginia – Episode 110, 5/14/12. Exploration of the Chesapeake Bay – Episode 140, 12/10/12. Water and settlement of Roanoke – EP181, 9/30/13. Water and the Civil War – Episode 101, 3/5/12; Episode 104, 3/26/12; Episode 164, 6/3/13. Water and the Revolutionary War – Episode 103, 3/19/12; Episode 168, 7/1/13. Water origins of Virginia Declaration signers – Episode 220, 6/30/14. Musical Tour of Rivers and Watersheds – Episode 251, 2/2/15. Geography – Episode 265, 5/11/15. USII.2 – relationships among natural resources, transportation, and industrial development.